While the technique and materials described above have many positive features, can they benefit the practitioner with only occasional needs? A system with most of the features in a simplified form was created for use in the training of coatings microscopy. A conscious effort was made to retain the most important features and eliminate only those important for mass production. The result was a disc form that was produced in two parts and would be prepared by hand. This form produces high-quality results, sacrificing only high throughput possible with the holders. The low start-up costs are also appealing to those who only occasionally need to prepare samples. The new system was dubbed “DA Disc” and it is based on the same resin system and a similar mounting technique. 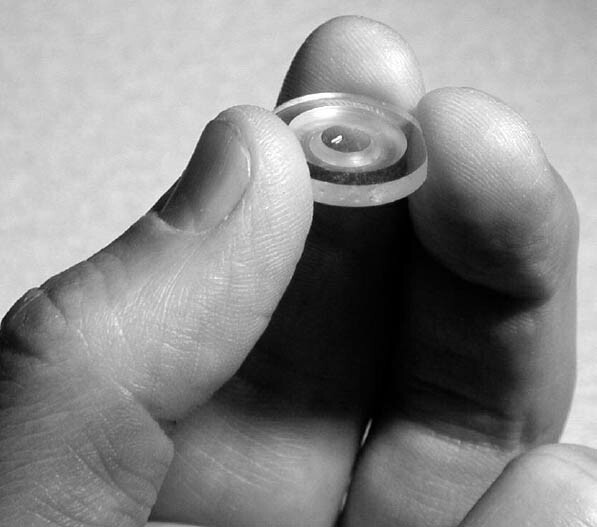 The ultimate form is a 20 mm diameter disc, about 6 mm thick (fig. 22). The disc has a center portion similar to the tablet, as it encapsulates the sample. The perimeter of the disc is a raised ring that keeps the sample in plane and minimizes the material removed in polishing. Since little material needs to be removed, the samples are discs that are about the same height (thickness) after polishing. 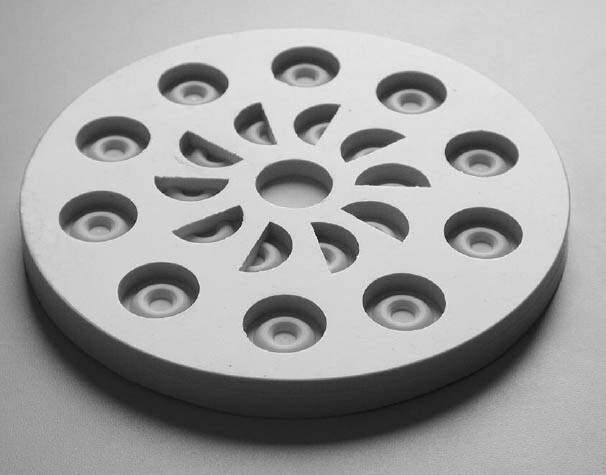 A custom-made mold is used to form the platform for the sample, and another for the final disc shape (fig. 23). The first portion is a precast for mounting the sample. If the final casting is done carefully on a level surface, parallel planes are ensured. The polishing can be accomplished using the same methods and materials described above. The disc can be hand-held during polishing (while wearing appropriate gloves). Although this method is not intended for high-volume work, excellent results can be obtained at low cost (for more detail and a comparison of methods, see Wachowiak 2002). Essentially, there are only four steps to preparation by this method. Embed the sample. Pour a small pool, no deeper than half the mold, into the full disc mold. Lower the mounted sample into the mold. Place on a level surface, and in a warming oven if desired. Polish the demolded sample. A file may be used to remove sharp edges (use it for this purpose only). Polishing film or papers can be used, starting with 600 grit. Working quickly will yield the best results. Document and analyze. Again, since the samples are approximately the same height, the sample plane will be nearly the same. Polished disc for easy production of single high-quality embedded samples. Under some circumstances, it is useful to modify normal procedures. Experiments were conducted to see if any would be useful in the processing of typical coatings samples. Benefits and deficiencies for several procedures are listed below. Silicone rubber mold produces half-and full-disk forms. Kitchen fruit and vegetable spinner serves as an inexpensive, highly effective centrifuge. Experiments have shown that centrifuging to remove bubbles of the mixed epoxy gives excellent results. While an expensive laboratory centrifuge will work, it can actually separate the phases of the epoxy if too much speed or time is used. Approximately one minute in a “salad spinner” ($15) (fig. 24) works at least as well as in the laboratory centrifuge. The closed plastic envelope of the Tra-Bond BIPAX makes this a clean, easy step. The spinner is used as part of our normal procedure (after mixing the resin and hardener) rather than vacuum or other methods described below. Warming epoxy resins for a few minutes after mixing (about 50°C for 10 minutes) will lower the viscosity. This result will help resin infiltration and allow small bubbles to rise and break before pouring. However, the pot life can be shortened to 15 minutes or less, depending on the resin mass. Adding more hardener (10% or so) will also drop the viscosity. This step will lead to solvent effects in some cases. There may also be shortened cure, increased hardness, shrinkage, and yellowing of the cured resin. Separately packaged systems can be easily modified, but it is impractical with the prepackaged Tra-Bond BIPAX. For more robust but porous samples, the vacuum method may produce good results. Placing the sample in the mixed resin in a partial vacuum can help remove bubbles and increase infiltration. The vacuum is created and then released several times to replace air with resin. But because the hardener is now more easily volatilized, an additional 10% or more must be added to ensure proper curing. As a result, solvent effects may be seen. Care must be exercised to prevent overheating the resin by creating too strong a vacuum, volatilizing hardener, or entraining air bubbles during accelerated cure. 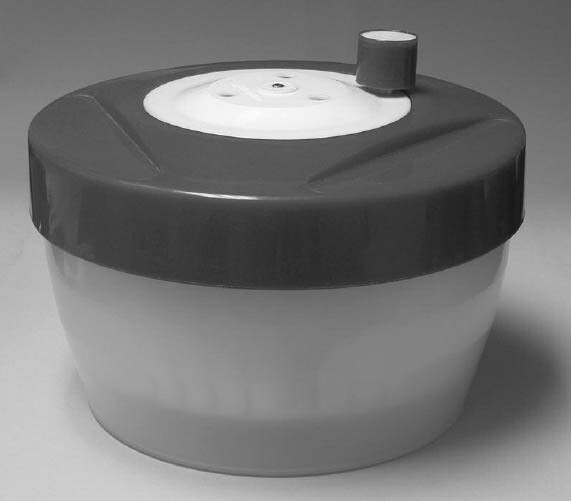 Like a vacuum, increasing the pressure in a container can promote infiltration and decrease bubbles. Conceptually, this method works by compressing the volume of resin, thereby displacing air. Tests using castings without samples were indeed very clear. In practice, porous samples still produced more than the acceptable number of bubbles trapped in the embedding. Since the cure is accelerated, bubbles from outgassing samples are evidently trapped in the epoxy. Ethanol is miscible with the resin and hardener, so it has been suggested as an additive to lower viscosity. Generally speaking, coatings samples are affected by exposure to polar solvents such as ethanol. Therefore, this additive is not normally used. For samples such as fibers or charcoal, added ethanol may be beneficial. If the sample is particularly porous, the best method appears to be to exploit a longer pot life. In this case, the sample (as well as the resin) is allowed to outgas. This process can happen over several hours when curing at room temperature. Bousfield, B.1992. Surface preparation and microscopy of materials. New York: Wiley. Chang, W. T., T.-H.Chen, C.-C.Yu, and J.-Y.Kau. 2002. Comparison of embedding methods used in examining cross-sections of automotive paints with micro-Fourier transform infrared spectroscopy. Foren-sic Science Journal1(1):55–60. Derrick, M., L.Souza, T.Kieslich, H.Florsheim, and D.Stulik. 1994. Embedding paint cross-section samples in polyester resins: Problems and solutions. Journal of the American Institute for Conservation33(3):227–45. Electron Microscopy Sciences. 1999. Personal communication. Product technical support. Fort Washington, Pa.
Khandekar, N.2003. Preparation of cross sections from easel paintings. Reviews in Conservation4:52–64. Laurie, A. P.1914. The pigments and mediums of the old masters. London: Macmillan. Martin, J. S.1992. Observations on cross-section examination of painted and coated surfaces. American Institute for Conservation Paintings Specialty Group post-prints. American Institute for Conservation 19th Annual Meeting, Albuquerque. Washington, D.C.: AIC. 39–42. Tra-Con. 2003. Product literature QAF-1057 Rev B. Bedford, Mass. Tsang, J. S., and R. H.Cunningham. 1991. Some improvements in the study of cross sections. Journal of the American Institute for Conservation30(2):163–77. Wachowiak, M. J.2002. Routine and high-volume preparation of embedded cross sections. Microscope50(4):147–53. Waentig, F.1993. Gießharzsysteme zum Einbetten von Proben. Restauro3:195–99. The Smithsonian Institution has licensed McCrone Microscopes and Accessories (850 Pasquinelli Dr., Westmont, Ill. 60559;  622-8122) as the supplier of holders and molds designed by the author, as well as resins, abrasives, and other supplies. Licensing fees support Smithsonian Institution programs and research. MELVIN J. WACHOWIAK JR. is a senior furniture conservator at the Smithsonian Center for Materials Research and Education (SCMRE). He joined the Smithsonian Institution in 1989 after graduating with an M.S. from the Winterthur/University of Delaware Art Conservation Program. He was director of the Furniture Conservation Training Program at SCMRE from 1996 to 2002. His current work is research on the materials and technology transfer of painted Spanish and Native sculpture in colonial California and northern Mexico.